Herald: A master of movement and expression, a sculptor of silence! A master of movement and expression, a sculptor of silence! and white scarf, a black flat cap, white gloves and a face adorning a white mask, Drupad Gaonkar leaves the audience spellbound, not only with his attire but with his ability to suggest a thousand different impressions. One of India’s leading mime artistes, the celebrated Goan is known to produce an astonishing variety of brief dramatic scenes and comical encounters with himself during his amazing performances. As Drupad returns to his hometown for a series of workshops at Carmel College, Nuvem and Carpe Diem, Majorda, it’s all about about giving back to his motherland. “To Mother Goa, I do not think I can give enough, not until now. Whenever I have given something to her, she has given it back to me, manifold. However, to Goans, I have been giving since a very young age, perhaps since when I was 14, by sharing everything I know, by training my students at various places for free for a long period of my life, by putting all that I earned into the performing and visual arts in Goa, by influencing various people unknowingly at first and now consciously. It is not that I have believed in giving; it is the one thing I know best. So be it,” says Drupad. When asked what it means to be performing in Goa, Drupad reiterates that he is here to take care of his mother and that these workshops are a consequence of that. Presently at the Carpe Diem workshop being held today, September 9, 2018, he will introduce topics like improvisations and concepts like ‘acting is reacting’ along with body movement techniques of mime that can be used by a novice to understand oneself and a performer to enhance one’s own skill set at the same time. “To prepare for mime is to understand oneself and the selves of others. Working on the body is primary but so is one’s own psychological and emotional makeup. I dance to keep my physical being strong and do Pranayama for breath control. I read a lot to give my mind the required fuel for thought. My method of preparing is unconventional. I just mentally prepare the act and write down the technical part and my physical being just enacts it through memory. I have always been able to do this. Even if I am performing with someone else, I can help them do this. The body is amazing if you know it. Please try speaking to it and tell me what it tells you,” adds Drupad.The students at the South Goa venue will putting up a performance at the end of the full day session. Durpad further elaborates on the message he would like to impart to students that wish to take this up as a potential career move. “This field is very unique and will, by its own accord, put you in touch with many aspects of not only the performing arts but also fields like psychology, physiology, philosophy, religion, education, current affairs and so on. Allow it to do that to you. 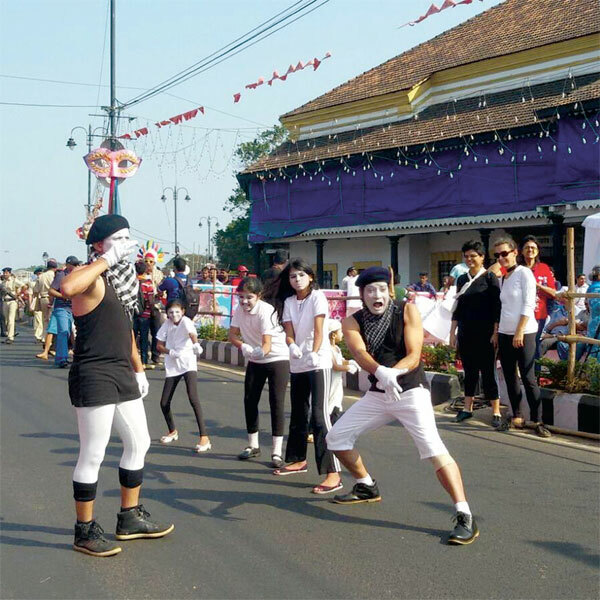 Try not to go on a social rant using the silent art form of mime as many use mime for; instead, dwell in it to understand your audience and yourself,” says Drupad. Incidentally, he got into mime by meeting a mime artiste in South Goa. “I got into mime thanks to Dr Isabel Santa Rita Vas. She mentioned that there was a mime artiste in South Goa called Newton who wanted a partner to perform with him for IFFI in 2004. She thought that I fit the bill. I was excited that I would be able to work in a performing art rarely touched by any. I also hoped that I would be able to work with Newton for my productions. I were not able to work together because of time constraints. He later went to London, which made me decide to take up mime for a short while to promote it. I took a lot of theatre artistes and dancers to the venues where I performed so that they could start miming and either make it their part-time or full-time career. There were many reasons that did not happen. I sometimes say that I entered mime metaphorically from the back door considering that most of my prior life in performing arts was backstage and pre-production,” he reminisces. Drupad further adds that he had not chosen the formal path to educate himself and that after his high school, he remembers having enrolled in Open University just to learn certain subjects in the curriculum to understand it and not answer it. He has worked in various fields within the hospitality industry and also gained experience in areas like advertising, marketing research, sales, accounts and human resource, among other fields. “I was influenced by my father who was analytical and artistic at the same time. I loved that about him and tried to search this quality in others. My learning started there. It is when I took up to reading Sri Aurobindo that my curve got an immense boost and purpose. It is through his word that I seek my future,” adds Drupad. Drupad has been inspired by great people who were able to sacrifice themselves for the sake of others or for a higher purpose. He remembers his father bringing home books like Amar Chitra Katha, Chandamama along with biographies of great men and he always dreamt that one day all would emulate their qualities. “I am still dreaming,” he quips with an expression that lights up his face. He has now become an inspiration that youngsters dream of emulating and Drupad is keen on creating awareness on mime. This was one of the factors that motivated him to break a World Record recently, when he performed a 50 hours Mime Marathon in February 2018. Against this backdrop of a phenomenal career, when asked to dwell upon what was his best performance till date and what’s next for him, Drupad says to choose one is very difficult since they are innumerable in number. “I do many types of performances which range from 10 minutes or one hour mime acts on stage or three-hour performances at restaurants. However, I have always loved the experience of performing to Sri Aurobindo’s epic poem ‘Savtri’, which I have been working on since 2008. The attempt is to perform the entire 24,000-line poem into mime,” adds Drupad. When asked what’s the best feeling while performing, Drupad talks about how every performance helps him understand himself and that in all his performances, no matter the venue or occasion, he concentrates more on the individual, his inner most self and the self of the audience; the result is much more beautiful. “I perform because it brings me closer to understanding myself. That is the time I am most conscious. The audience may be sensing this and hence enjoying the art. What I love to do the most is to learn. This has always been my primary task in life. Learning while reading, learning while chatting with friends, learning while eating, learning while looking, living, laughing and on and on and on,” says Drupad. Drupad has amalgamated his knowledge acquired in the fields of performing arts, hospitality, industry, IT and education, of which he has more than two and half decades of experience, into the silent art form of mime. The result of adding such a potpourri into mime has led Drupad to custom create products of mime that make it possible to be part of discotheques, restaurants, malls, weddings, street, stage and venues that are usually not associated with the art form. He has been able to choreograph mime acts for gatherings, tagline releases, sports parades, street shows and special events. He has performed for hours non-stop, including his recent record breaking 50 hours non-stop mime performance in February 2018 in Tamil Nadu. He has created awareness about the various forms of mime that exist worldwide and about the mime artistes that represent those forms. He is also credited for making mime commercially viable like an applied art, thus helping the artiste, the product and the art form. The creation of the open commercial mime group ‘IMIMEGINATION’ is one such example.